Billing itself as the best way to collaborate and communicate in a group through mobile video, Vidopop is a video note and messaging app that allows users to record and send videos of ANY size to anyone and any app instantly. From a classroom perspective this app can facilitate group work at a distance, deliver feedback from teachers to students, and be used to create lessons and presentations with ease. The application is free and comes loaded with 10GB of storage. Additional storage comes at a price ($5 a month for up to 100GB, $40 a month for up to 1TB). Teachers can download the app through the App Store or Google Play, sync their contacts, and away you go. Vidopop also integrates natively with some of your favorite tools like Box, Evernote, etc. You can also embed links of your videos into other tools or social media platforms for viewers to watch. But here’s the best part: viewers do not have to have the app downloaded to watch the video. If a teacher wants to push out an introductory message to parents during the first week of school, they can view it on their iPads, Androids, desktops and many other devices at their convenience. Though teachers have always been overly cautious about the use of video in the classroom, BYOD is about to push the issue even further. Students are going to be enabled with a camera and video recorder every time they step into their classroom. Rather than fear that power, why not EMpower them? More often than not, new concepts and feedback are faster to explain through video rather than text. 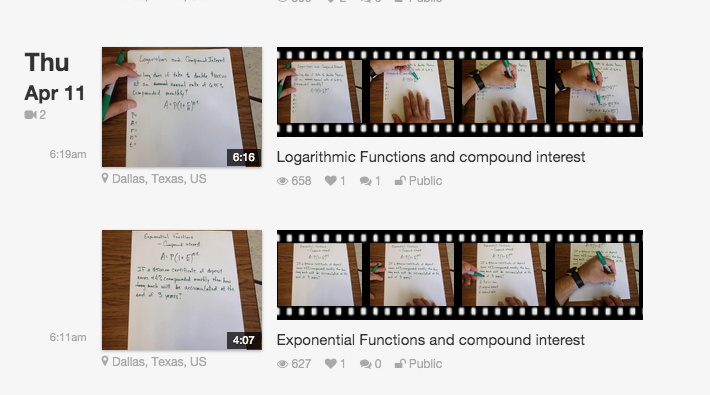 Students can film the materials they are studying, draw out equations, and 1000’s of other activities that can now be documented and shared. Teachers will now have the ability to flip their classrooms with ease by pushing out video reminders, lessons, and other relevant information. The most important piece to me is that this can foster real collaboration between students and teachers inside and outside the classroom. But will this have an impact on student success? According to the Dallas Independent School District it does. In a case study completed in 2013, two algebra classes were studied with one identified as a ‘hybrid’ class that received the majority of their instruction through educational technology and Web tools. Students were able to watch lessons through Vidopop, catch up on missed work at their convenience, and ask their peers questions about the lessons (through video), even at home. The results indicated that by the end of the semester, the hybrid class outperformed the traditional class by 19%. See the full study here. Just from the few times I’ve used it, I’m highly impressed by the ease-of-use of Vidopop and I predict a rapid expansion into the K-12 space over the next year. This Silicon Valley startup is on the rise and already generating a great deal of buzz. For those educators weary of using video in the classroom, I strongly recommend you give the app a quick download and Vidopop will take care of the rest. Your students will love it. Happy collaborating! I just got a response from video pop. Apparently the teacher retains proprietary rights to material made with video pioneer and all videos are private. They can only see them if you send them a link. Call me so that's good news. Great news. That way parents only have access to their child's content.